This essential companion volume to the Hillfolk roleplaying game brings you more settings for storytelling, and deeper insight and advice for using DramaSystem to its fullest potential. Darke and Stormy Nights: In this gothic soap opera, two conniving families of American aristocrats seek to control the fortunes of the coastal town of Storm Cove, unaware that a supernatural evil is about to awaken. Alma Mater Magica: After years of drifting, divorce, and disappointment, former friends who saved the world as teenagers return as faculty members to the tradition-bound boarding school that trained them to be wizards. Secret of Warlock Mountain: Telepathic alien castaways build a new home on a strange and frightening world: Earth in 1965. Family Business: When the law closes in, a family of crooks, con artists, and thieves has to rely on everyone’s skills and loyalty. Plus live-action roleplaying (LARP) rules from author Emily Care Boss, to take the drama off the couch and up onto its feet! Play richer and bolder live characters than ever before. 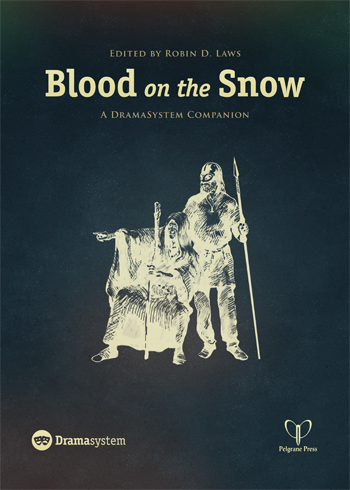 You’ll need Hillfolk, the original book of DramaSystem roleplaying, to enjoy Blood on the Snow.